What would you do if your mother destroyed Chicago? That was the problem for James Patrick O’Leary. In 1871, when Little Jimmy was two years old, fire broke out in the barn behind the family home on De Koven Street. The flames spread, and within two days, most of Chicago had burned down. Somehow the legend grew that Mrs. Catherine O’Leary’s cow had kicked over a lantern and started the whole disaster. Well, what would you do if you were Little Jimmy O’Leary? You’d grow up into Big Jim O’Leary, the gambling king of the Stock Yards. O’Leary started small time, running errands for local bookies. His major coup came in 1892. Heavyweight boxing champ John L. Sullivan was defending his title against James J. Corbett. O’Leary liked the challenger, and bet everything he had on Corbett at 4-to-1 or better. When Corbett won, Big Jim had his first stake. He opened a “resort” at 4185 South Halsted Street, across from the main entrance to the Yards. The license said that O’Leary was operating a saloon, which included a bowling alley, billiard parlor and Turkish bath. But soon everybody in the city knew you could get down a bet at Big Jim’s place. O’Leary prospered. In 1901 he built an elaborate Renaissance chateau at 726 West Garfield Boulevard, a few doors down from the fashionable Chicago Bicycle Club. 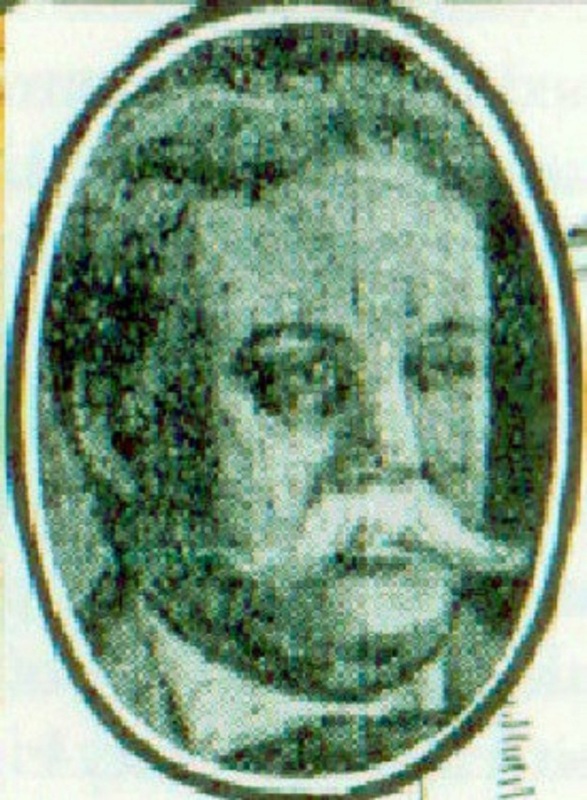 The architect was Zachary Taylor Davis, who later designed both the city’s ballparks. There is no record that O’Leary kept a cow on the property. Long before suburban shopping malls, O’Leary started a branch location in Du Page County. He called it the Stockade, and it opened in 1904. Local officials were paid $5,000 a week to look the other way, the Santa Fe Railroad ran Gamblers’ Special trains, and for awhile, the place boomed. Then some reformer busy-bodies got into the act. Big Jim had to close the Stockade and pay a $1,700 fine. There were other attempts to diversify. O’Leary operated a gambling ship on the lake called The City of Traverse, and later bought Luna Park, a South Side amusement grove. Both ventures ended badly. The Halsted Street saloon remained Big Jim’s main concern. And he remained a local celebrity. Before every election, reporters would descend on O’Leary’s to have the proprietor predict the outcome. With much ceremony, Big Jim would make his pronouncement. It was fine entertainment in the era before public opinion polls. O’Leary was a product of his times. He stayed in business because the public felt gambling was a personal vice that didn’t harm society. The anti-gambling laws were not often enforced. Of course, it helped if you paid off the right people. Eventually the city grew up. Prohibition came, and the feds took the law more seriously than Chicago officials did. Raiders found a cache of illegal whiskey in the basement at Halsted Street. In court, Big Jim produced a pharmacist license, and claimed he was selling the whiskey for medicinal purposes. The judge ordered him shut down anyway. He was soon back in business, but it wasn’t fun anymore. There were more raids. O’Leary talked about retiring. Maybe he’d write his memoirs. After all, he told his friends in the press, he was a millionaire several times over. Like any gambler, Big Jim O’Leary knew you had to keep up a good front. When he died in 1925, his entire estate was valued at $10,200. 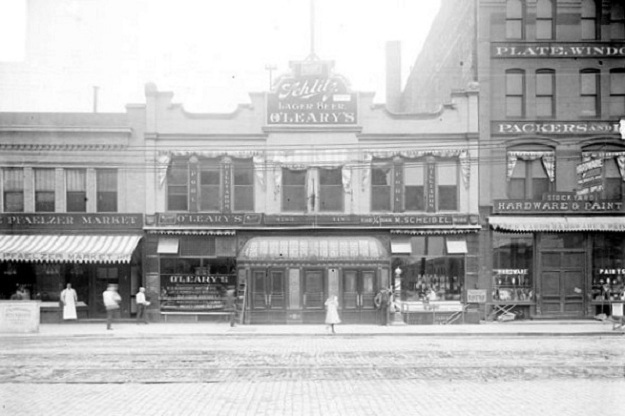 O’Leary’s Halsted Street saloon was torn down several years ago. 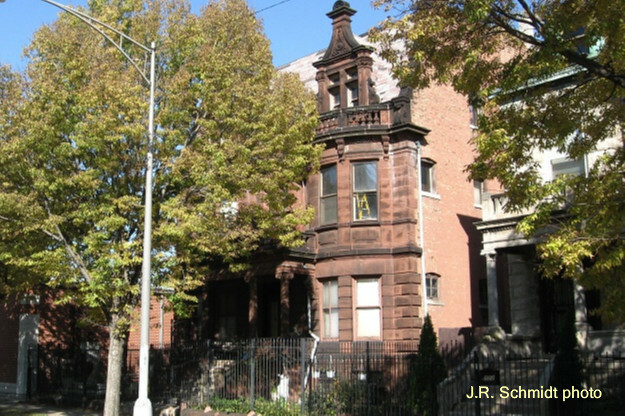 His Garfield Boulevard mansion still stands, and is privately owned.